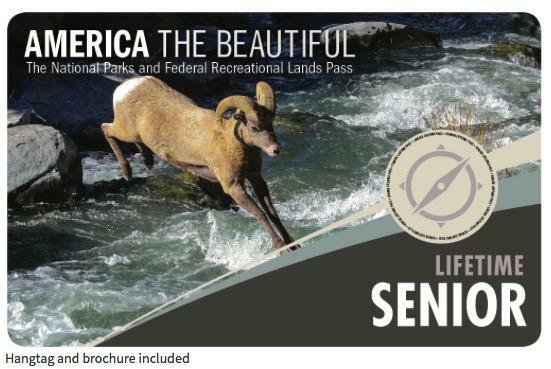 Up until the fall of 2017, Senior Citizens could obtain a life-time pass to all of the national parks for $20. The price was being raised to $80, and there was a big rush to get one at the lower rate. My local national park ran out of them, so I ordered it online. Because of the volume of orders, they said it would be 12 weeks before my pass came, but I could use the receipt to get into the parks in the meantime. I ordered it in July, and at the end of October, I received an email that the pass had been shipped, but come December first it hadn't arrived, and I figured it was lost in the mail because the mail forwarding from Colorado has not gone smoothly this year. For all I knew, it had been returned to the sender as undeliverable. I finally called the customer service, and they said they would send another one, this time directly to me here in Las Vegas. It arrived today, a lovely card with my name on it and a hang tag so I can display it in my car when passing through the gate of the park. It was addressed to me in Colorado, forwarded from there, and looking at the post mark, I see that it is the original mailing, sent October 27 - well ahead of the Christmas rush. It took almost exactly two months to get here. I think the the USPS is losing what little grip it had on providing a professional service. The more market share they lose to electronic services, the worse they get at what they do and the more they charge to do it. The post office is so expensive! E mail is free!. The more the USPS raises the rates, the more business they lose, but they still have a lot of overhead, including a controversial pension system, so then they raise the rates some more. I am afraid to ask what it costs to get into a national park without a pass. Where will you go first? The National Park Service is just now in the process of changing the admission fees for the most popular/overcrowded parks - 17 of them. There is millions of dollars worth of deferred maintenance to catch up with, and some of the parks are so popular it's taking hours to get through the gates, even with the use of shuttles. Not our idea of communing with nature, so the thought was to shift some of the business to non-peak months by raising the rates. A daily pass is $20, weekly pass is going from $30 to $70 during peak season (Jun - Sep). An annual pass is $80 and the fear is that park visitors will spend the $10 more to have unlimited access to all the national parks for the year. It's a local fear because the money goes to the location where the pass is purchased, so only one park benefits. Online purchases are applied to all the parks, even the ones that don't charge admission. This is good in some ways, but the whole reason for these sudden rate increases was to fund the maintenance/infrastructure backlog at the popular parks. The current Trump-appointee in charge of the national parks has said he wants to see more privatization of the parks, meaning in addition to gate fees, there would be more pay-to-play to use the trails and shuttles to get into the parks. Actually the USPO was at 99.1% delivery success so don't pick on them!! I can't wait to be a senior so I can get all the privileges you old folks get! I don't know where you got that number. When the USPS refuses to honor my forwarding order and returns my license plate renewal info or a royalty check or a Christmas card to the sender, that's 100% failure times how many times they've done it these past couple of months - 800% failure. Yes, they have failed to deliver 8 items to me since October - that I know of. Some overall national average is meaningless to the individual who relied on receiving what was sent to them. And that's not counting the ridiculous delays when they do decide to forward something, as described above.